Yes! It's time for galaxy nails, my very first time! 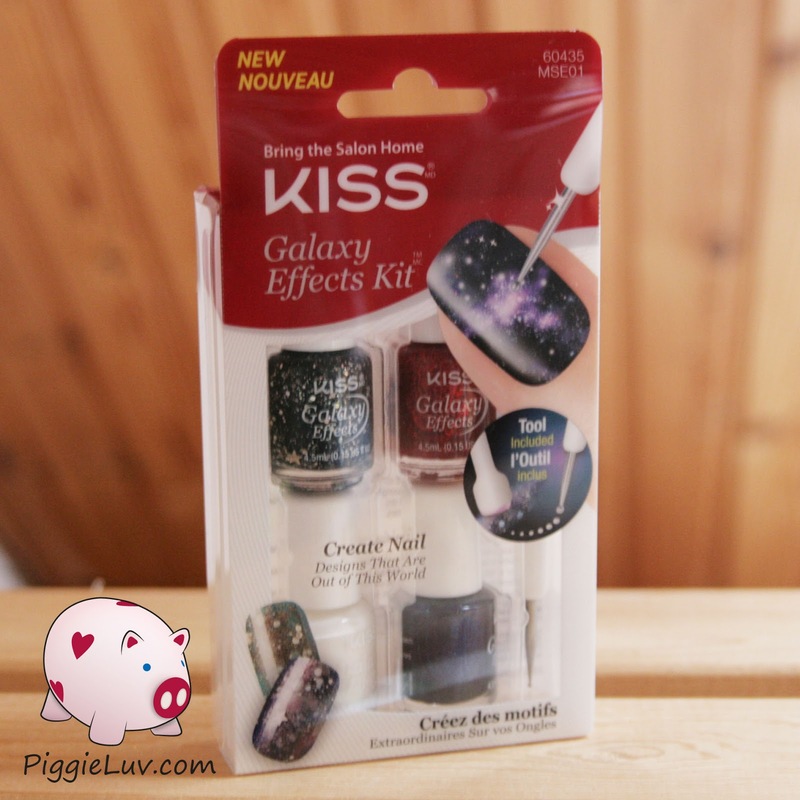 I received this Kiss galaxy nail art kit for review and for the life of me, I could NOT get this to work properly... Click to see my multiple attempts! I received some products from the lovely people at Anviri Cosmetics, and they import, distribute and sell a few brands. One of them is Kiss Nails, a brand with a wide range of nail art supplies! Imagine my excitement!!! I'm showing you a few this week, I started four days ago with the Kiss nail tattoos so be sure to check out that review if you missed it! Also take a look at my article about the nail art pens! 1. Start with a dark colored base; apply 2 coats of dark nail polish. 2. Apply 2nd & 3rd color polishes onto sponge; dab onto nail to create textured design. 3. Use the dotting tool to create dots; let dry. 4. 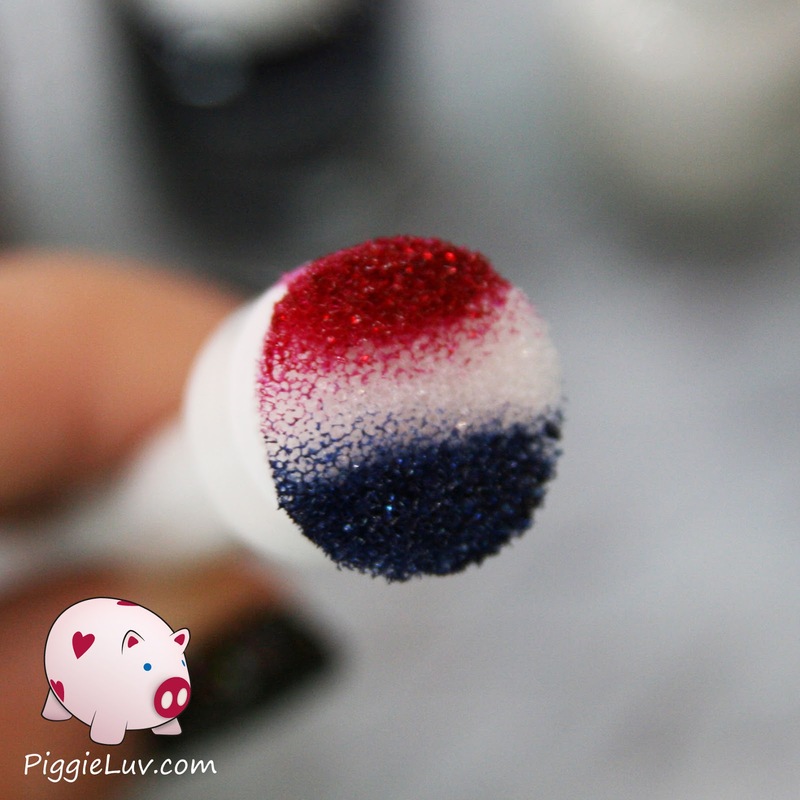 Lastly, apply glitter top coat for your stars. 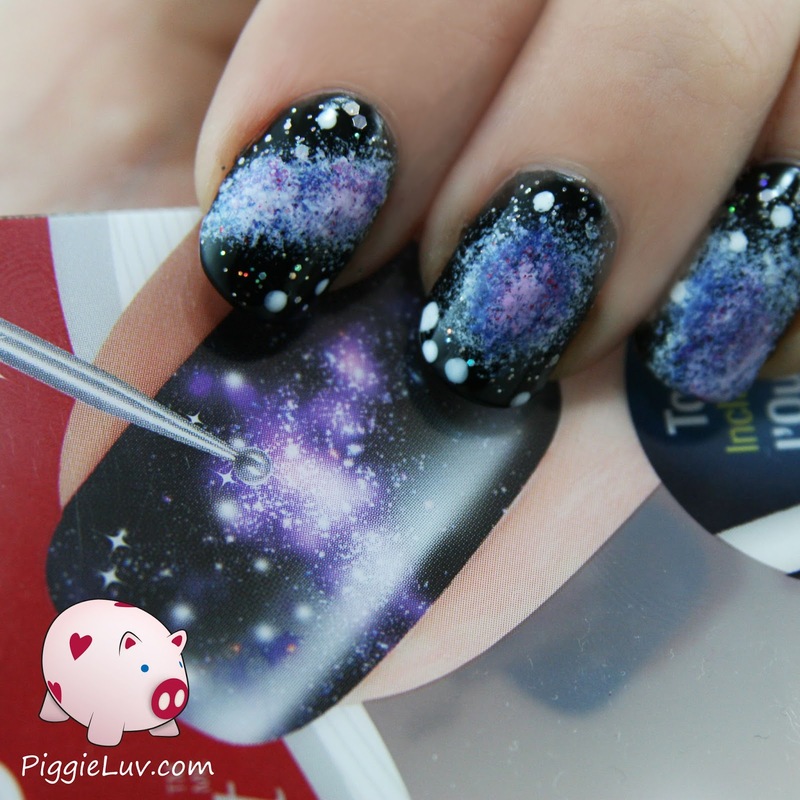 I couldn't make much sense out of these instructions, since this was my first time doing galaxy nails. A dark colored base, does that mean the dark blue polish that's included or my own bottle of black? I chose the black... From there, it became quite a mess! After my black base had dried properly, I tried to figure out what the instructions meant by 2nd & 3rd color... That's really confusing! If I had started with the dark blue polish, then I would only have red and white remaining and it doesn't look like they would make a good combination for a galaxy look. So with a wondering look on my face, I started by applying the red glitter polish with the sponge. I did red first because I don't like red so I was hoping that the rest of the process would disguise it for me. After that I sponged the dark blue on top of that and I added white dots lastly. It looks... interesting. Not so messy yet, just a bit too dark to be actual galaxy nails. Look what happens when I apply the top coat like the instructions say... Messy!!! 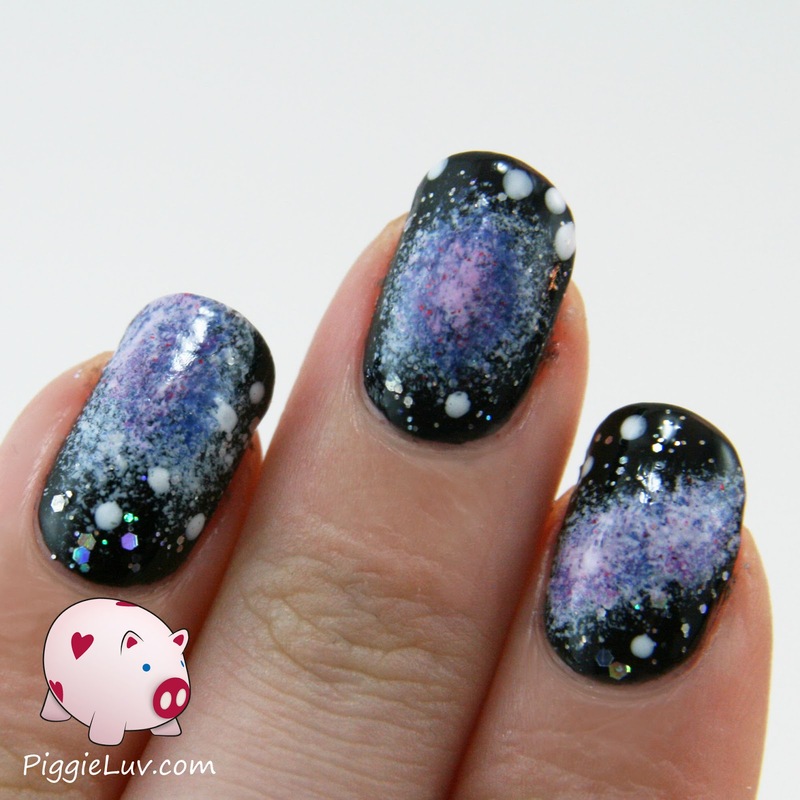 Do you see anything of what's supposed to be galaxy nails? Not me... It was the thinnest coat I could manage and it made my whole mani look like a mess!!! There's some red glitter peeking out from underneath, but the white dots were swallowed by the bigger glitters and the dark blue polish vanished completely! Time for a second try! This time, I left out the glitter polish completely (although I do like the polish for other applications) and applied the blue first with the sponge, and then the red on top of that. I added some white dots for stars and it looks kinda galaxy somehow, but it doesn't come anywhere close to what's portrayed on the package. It bothers me that the images on these kits are so fake. Maybe, if the nails on the packaging were actual nails done with this kit, I would have had some idea of how to use the polishes. Now I was just completely lost and it took me three tries to get even remotely close. So, yeah, my third try already... Because the glitter polish kept giving me trouble, I applying it straight over the black base this time. 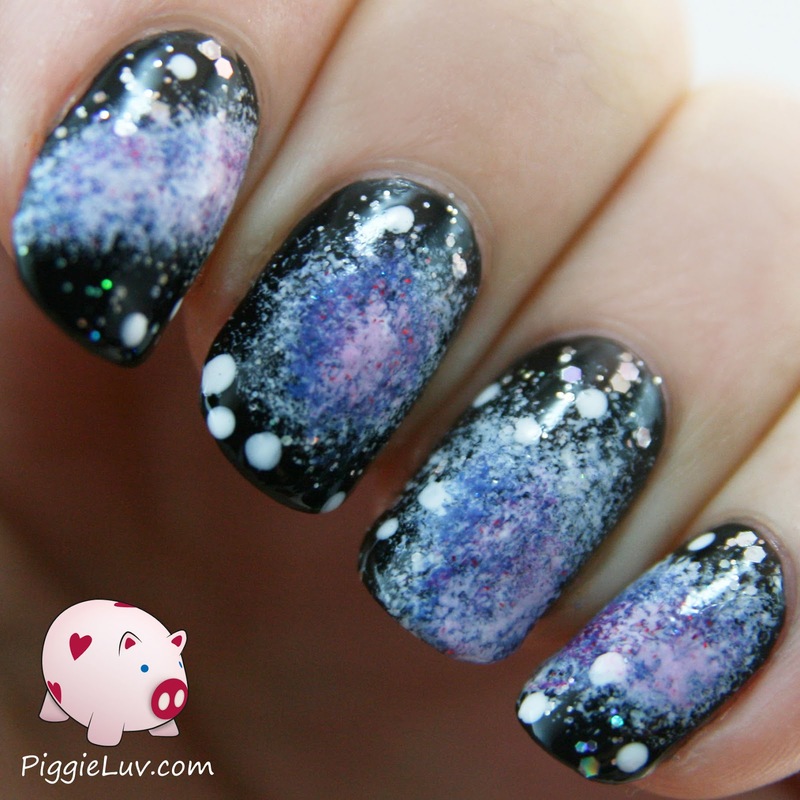 I also looked up some other galaxy nail art pictures on the internet and they all use lighter colors. That's why I decided to start with the white polish this time! When you just dab the polish on after applying it to the sponge, the edges get too defined and it doesn't look like it's floating in space. So what I do is, I take the sponge, apply a little bit of nail polish, and then dab it on something else a few times. This gets rid of the excess polish and when you sponge it on your nails, you get nice 'floaty' edges. Then I did the same with the blue, then the red and then the white again (just a little bit). Every color was dabbed a few times on a piece of plastic to get rid of the excess. I made some dots to finish up and then I added my own trusty Sally Hansen Insta-Dri top coat. Does this look better to you? I think it still looks like a big old mess... but closer to galaxy nails than before, that's for sure! Here's a side by side with my nails and the packaging. Really? Seriously? I came pretty close but no-one is ever going to make their nails look like this, despite what the packaging wants you to believe. The colors are wrong. Lighter colors would have made a better kit, like I proved with sponging on the white first. I was able to use the sponge three times before there were no clean spots left. It's pretty good, but next time I want to use it, I would have to cut up a new piece of sponge. The packaging is misleading (I HATE that!) and the instructions aren't very clear. I really hope this article can help when someone googles it! The polishes by themselves are pretty cool, just like the dotting tool. It makes pretty dots and was easy to hold. And that's it! Thanks for reading and be sure to check out my other reviews about the Kiss nail tattoos and the Kiss nail art pens! I received the products in this article as a press sample for an honest review. Opinions expressed are 100% my own and not influenced in any way other than the quality of the product itself.